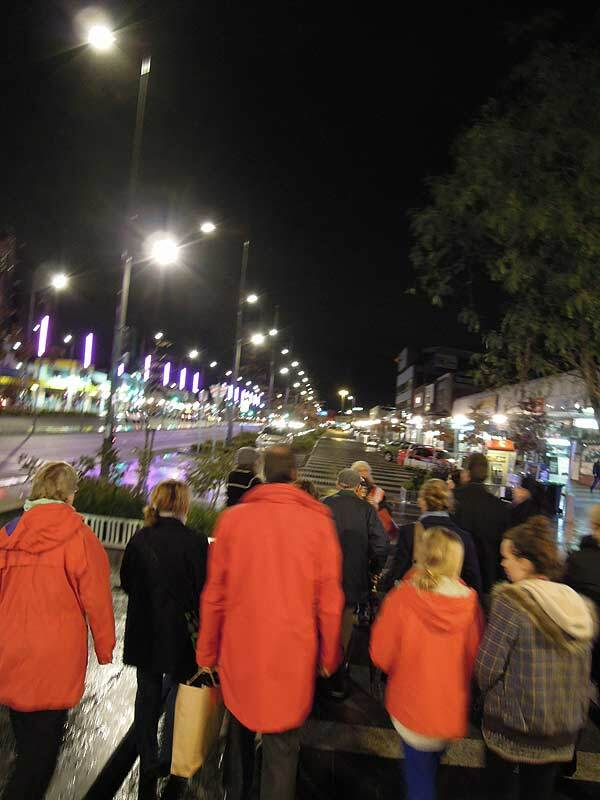 Last night I went on the night walk tour of Dandenong’s Nocturnal festival, a public art festival in collaboration with Chisholm TAFE and RMIT University’s Masters in Art in a Public Space. It was an amazing two hours, walking around the CBD of Dandenong taken down alleys and through carparks to various works of art scattered around. Most of the 45 artists who took part were also stationed by their works, to talk a little about them and answer any questions we had. 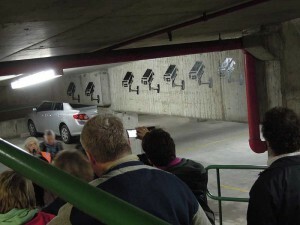 This year’s Nocturnal theme was Carpark, and it was really interesting to see how different artists interpreted this in a wide range of media. I’m going to recount the tour, rather than just talk about a couple of the artworks, because I think that the whole experience was magical and I want to be able to describe it all in detail. We started at The Drum theatre, which is the old Dandenong Town Hall. 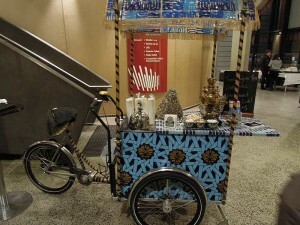 Waiting us in the foyer was the Afgan Tea Cycle. 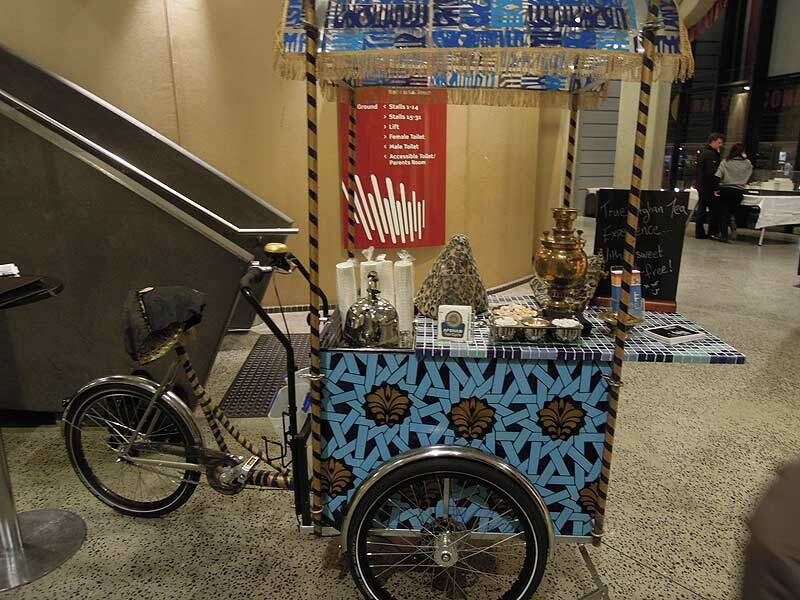 The Afgan Tea Cycle was a joint project by RMIT Art in a Public Space and the Dandenong City Council to create an authentic Afgan Tea Cycle here in Melbourne. It has a beautiful blue and gold authentic Afgani design painted on it and there’s something wonderful about behind handed a small cup of hot, sweet tea and collecting a couple of the chick peas in a candy coating to start your adventure. Then we were off and walking. 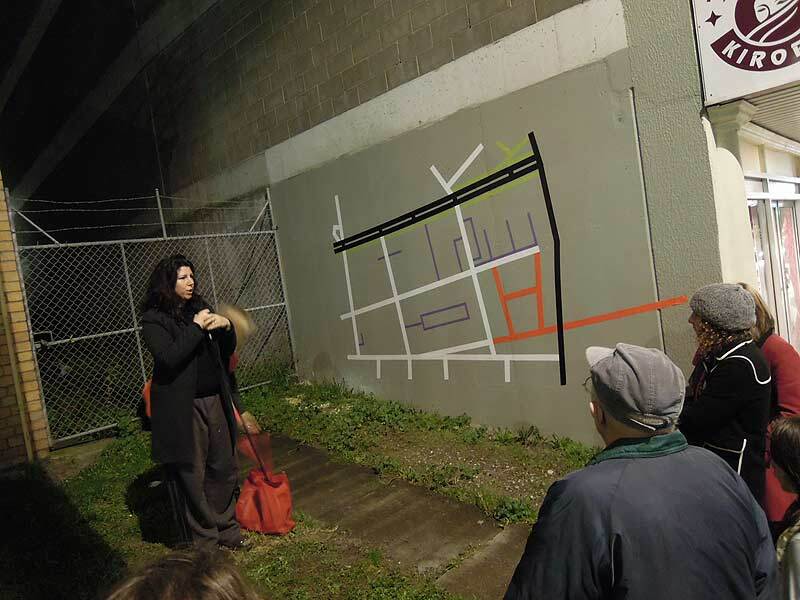 Our tour guide tonight was Grissel, the council’s officer in charge of public art, so we had a tour chock full of interesting and relevant facts about Dandenong and the art we saw. The first piece of art we were introduced to wasn’t actually part of the tour, instead it’s a temporary work that will be on display for about another year. It’s by Robbie Rowlands but I’m not sure of it’s name. 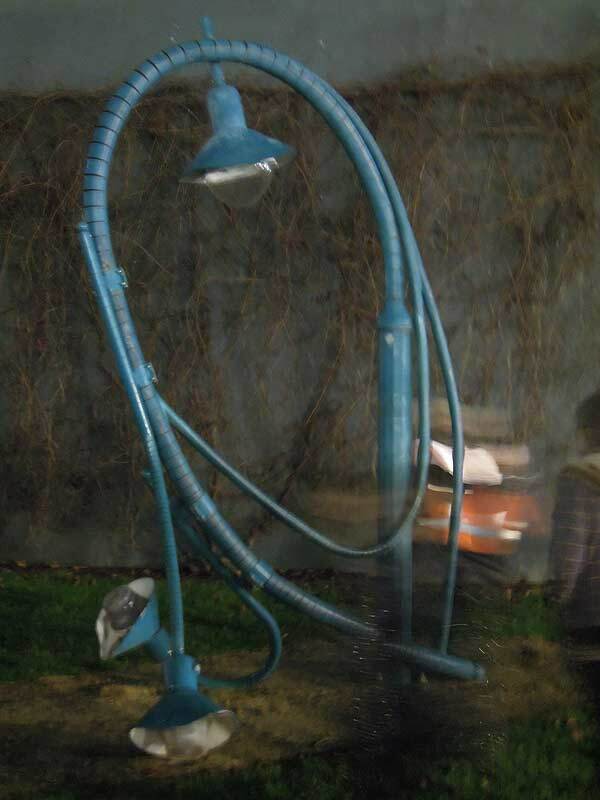 We met the artist later in the tour, he talked about how he feels street lamps have lit the path for so many years, now he thinks it might be tired and want to just lie down for a while. In these works, he wants to create sadness in the viewer, showing us how old and tired these utilities feel. 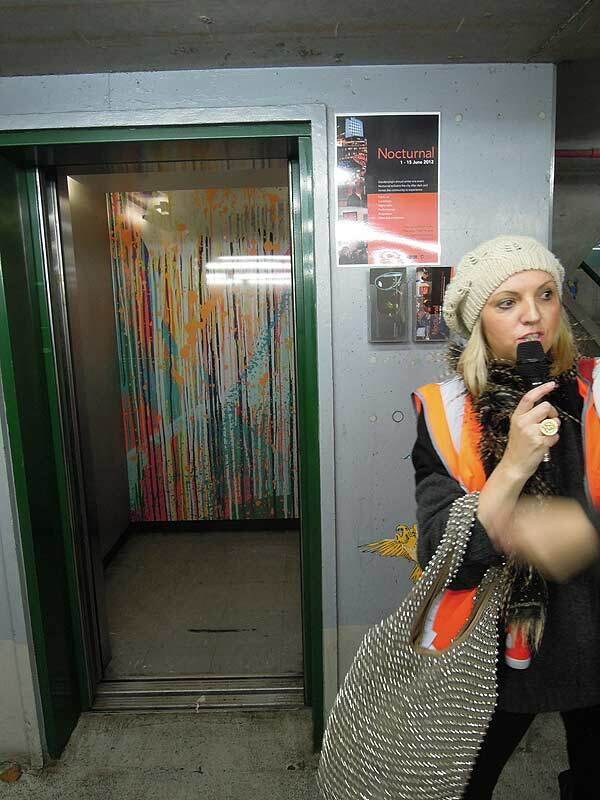 Next up we came across our first Nocturnal artwork proper and certainly the largest on the tour. 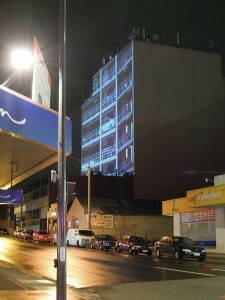 Projected on a eight story building are a selection of works from previous Nocturnal years. 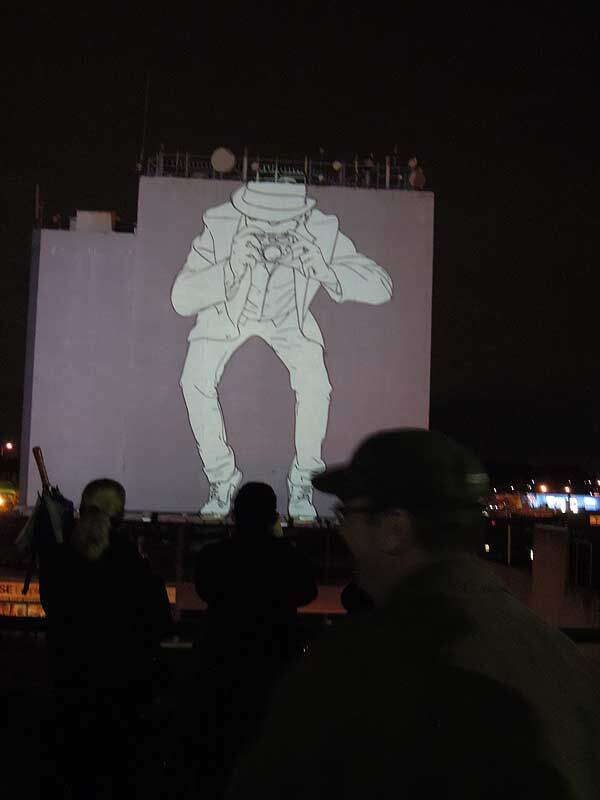 The sheer scale of these projections are incredible to see from the street, but Grissel assured us that there is a better spot to view them from later in the tour. 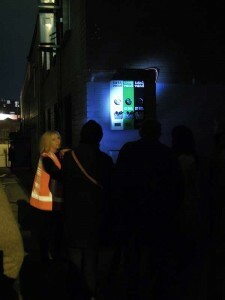 Next we entered the Thomas St car park, where Robyn De Vries work, Reverie Mark II was situated. 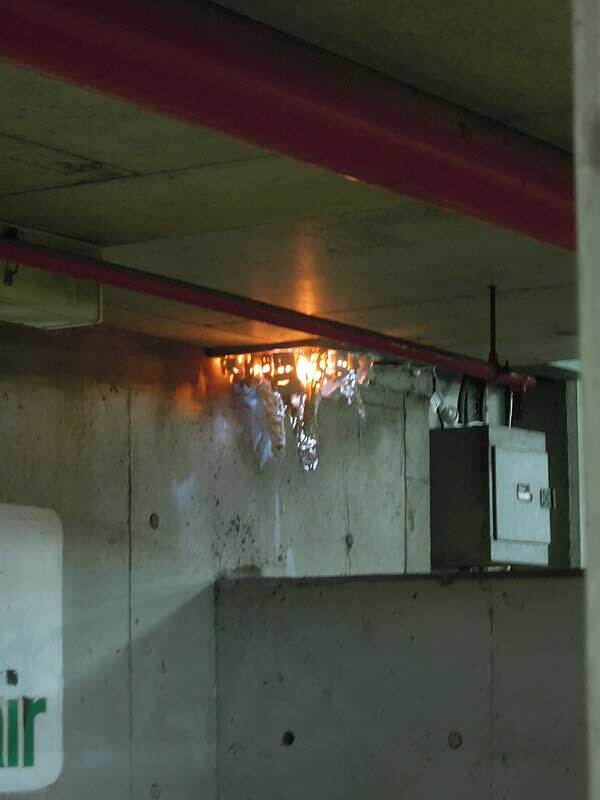 This work utalised the now redundant toll booth, where the car park attendant once sat, taking the money for tickets. 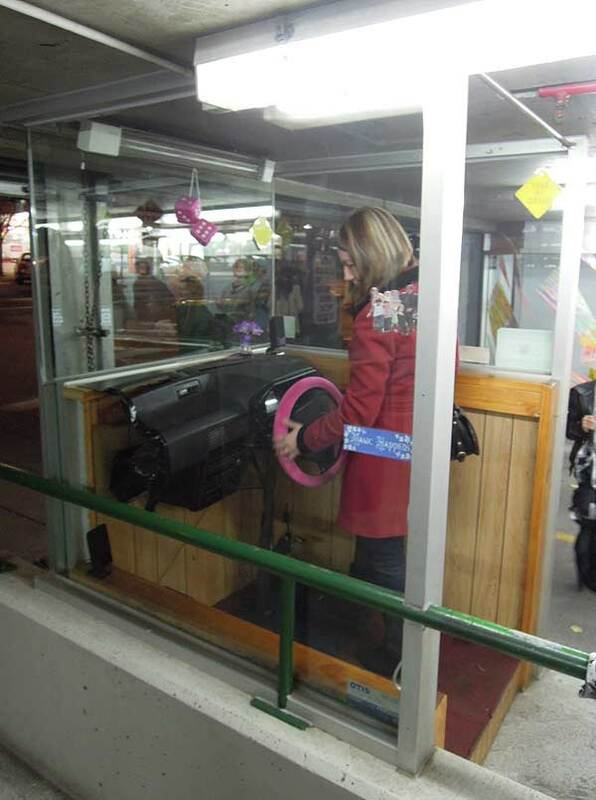 Now, instead, there was a car dash and a bright pink steering wheel, accelerator and various bumper stickers ranged around the glass. When pressed, the accelerator created a soundscape. I could see what the artist was aiming for, and interactivity is always nice in a work such as this, but I felt that this work just didn’t quite live up to some of the other works in thought and execution. 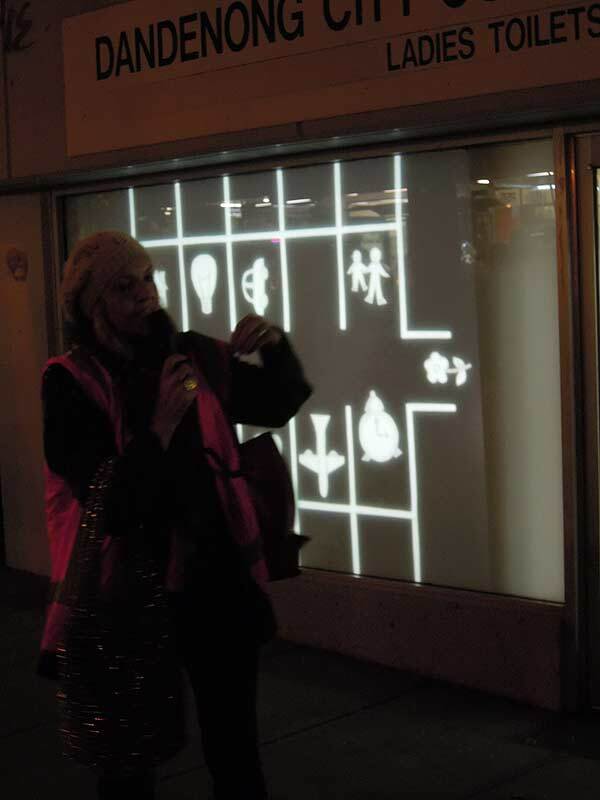 We quickly touched on Rowena Martinich’s Chromablitz , which ranges across the glass wall behind De Vries’ work, again, another longer-term temporary artwork commissioned by the council, but we didn’t spend a lot of time on it, for there was more Nocturnal to explore. We headed back outside where there was a number of digital animations from the students at Chisholm, pictured is a cute little stop motion animation of figures moving in and out of car parks. Next, we climbed to the top of the carpark to get a better view of the 4 story projections. Ian de Gruchy, one of Noctural’s featured artists, talked to us a little about the various works, This one by Anthony Kraus was one of my favourites. Next, we headed to the other side of the carpark, where Kosar Majani’s beautiful work Parking Culture was situated. 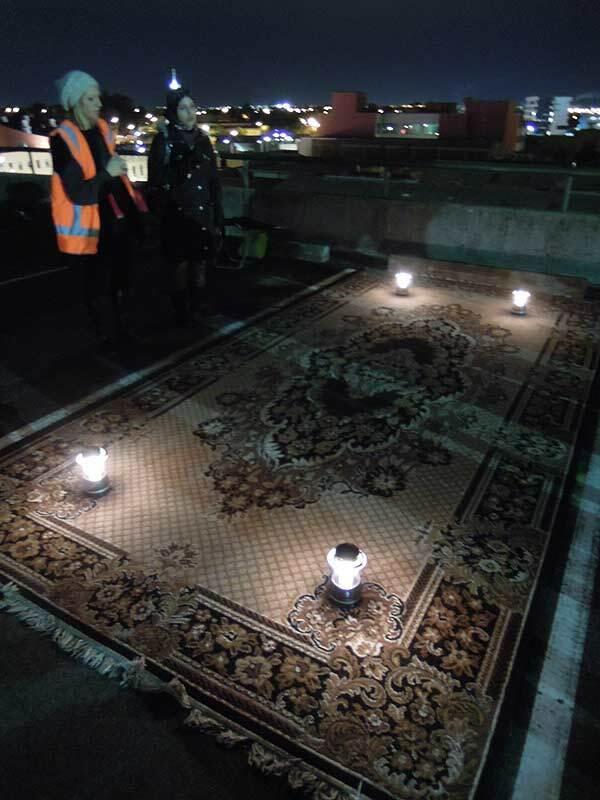 Kosar has sourced a Persian carpet and affixed it to a carpark bay. 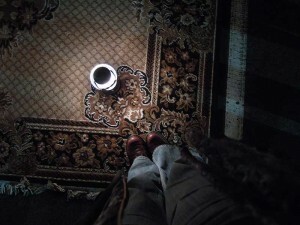 She talked about the culture of these carpets, including the different kinds of patterns, the meanings behind the colours and a little of the history, including that a Persian family would keep the rug in their best room (the guest room) and keep it spotlessly clean, but that when they went on picnics they would take the rug to sit on. 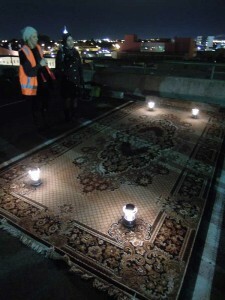 This rug will stay in the carpark for people to sit, stand, park on or avoid until it disintegrates. At the end of Kosar’s talk, several teen boys gleefully lept onto the carpet and sat on it, which I admitted as the carpet was wet from the rain. But awesome that they felt empowered enough to interact with the art. 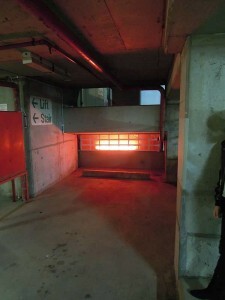 Next, in a undercover concrete bay, we were introduced to Nick Hackett’s Back of the Holden, which had a radiator feel to it, warming me against the cold night. The artist talked about being caught in peak hour and how this is the only thing you see when stuck in traffic. He also spoke about how much red there is in the Thomas St Carpark which is reflected in the work. The whole time we had been in the car park, we had been surrounded by thudding beats of car stereos, and it was now our turn to view this work. We walked up a concrete ramp to be confronted by 5 powerful and glowing cars, all blasting music. This was Daniel Denholm’s Trio for Car Stereos and it was incredible. Let me walk you through it. Ranged around this level were 5 cars with their boots and doors open and lights all on. Each car is pristine with incredible paint jobs and amazing lights and each car had a different track pouring out of it’s many, many speakers. One car had orchestral passages, another synthesizer noises and a third digitally altered found sounds from the streets of Dandenong. Each was different but added to the symphony. I really wanted to capture this by video rather than photos, as it really was incredible to experience. 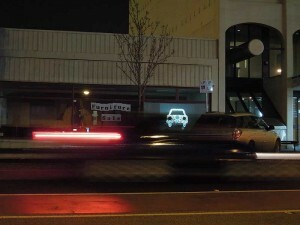 It also showed me these cars in a whole new light. 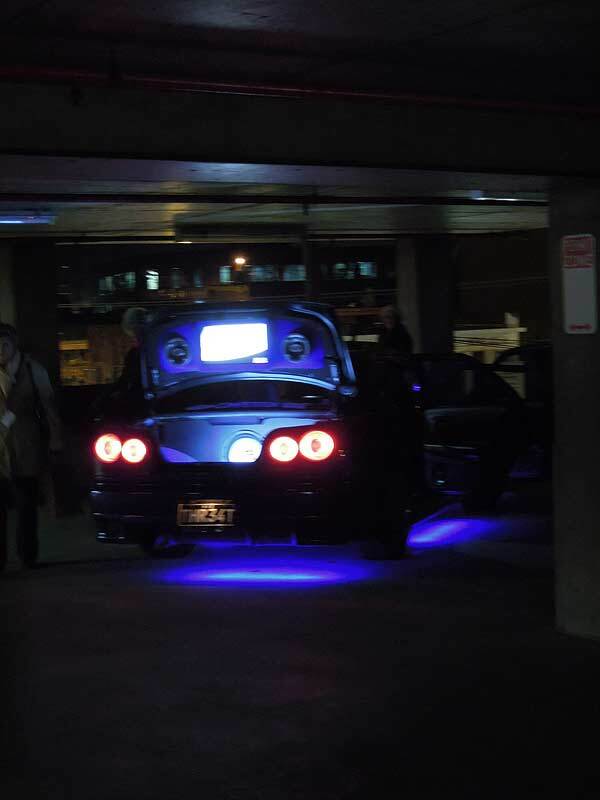 These cars are all quite amazing works of art, lovingly created by their owners with thousands of hours and dollars poured into them to make unique monsters of sound and light. One, the Terminator, even had a smoke machine to create a spooky atmosphere as the metal head and shoulders of the Terminator, equipped with glowing red eyes, rose out of the boot. None of these cars were created for this work, they were all sourced from private owners through a local car audio business. Next, on the way back down the carpark, we passed another Robbie Rowlands and then discovered the smallest piece in the festival, Georgia Mill’s Looking In, a tiny ceramic town which suggested urban stalactites growing from the roof. 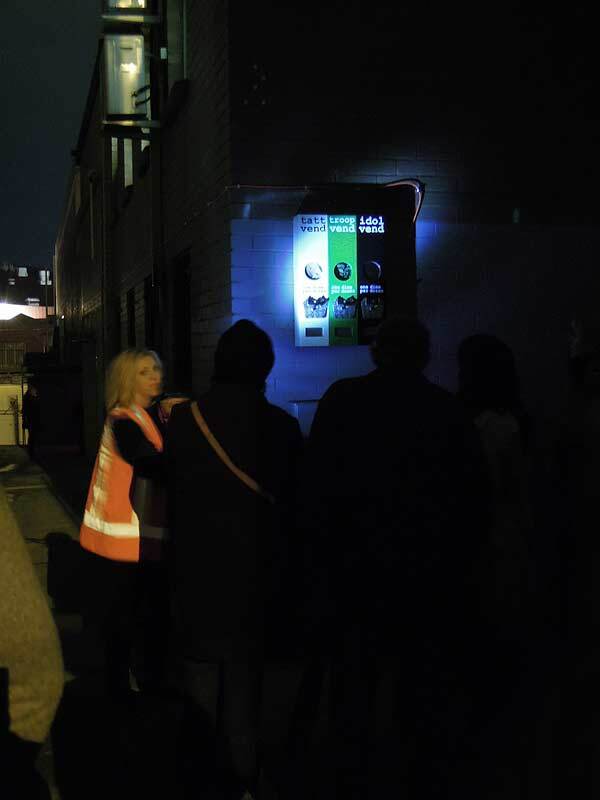 We also passed Daniel Wyatt’s Dark Spot, a stencil work about surveillance which has been scattered through Dandenong for the festival. 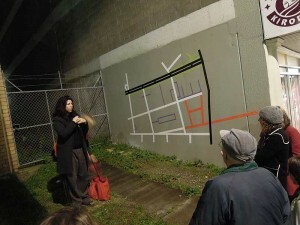 At this point in the tour we were introduced to Robbie Rowlands and he talked us through his next two works, a parking meter and another street light. Robbie mentioned that someone thought a car had backed into this streetlight and collapsed it, which he thought was great and he then revealed to us his fascination with poles that have actually been backed into by cars. He pointed one out further down the street as a shape he particularly liked. We were then lead down an alley where Riza Manalo and Janette Hoe’s Where should the birds fly after the last sky?, a darkened car sat. We were handed torches and told that the work interacts with the light. 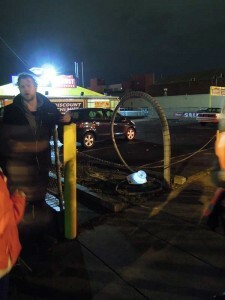 As people turned their torches on and peered into the car it became apparent that between the branches that filled the car there were performers moving slowly and items caught in the braches. It was difficult to tell what the items were, I couldn’t really get close enough to the car to peer in, but I did see a bread roll and an orange through the back windscreen and the person in the drivers seat appeared to be unpacking food from a picnic basket in slow motion. As I’m narrative driven, I wondered whether the people in the car had crashed in a forest and died and now, as ghosts, were forced to repeat the same actions over and over. It also spoke to me about every fairy tale and every myth that’s set in a forest and the things that befall the characters underneath that dark canopy of trees. 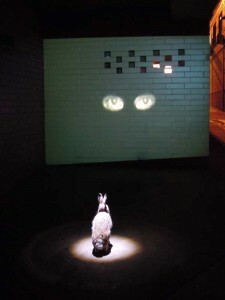 and around the corner to Empirical Eyes by Jade Burstall. 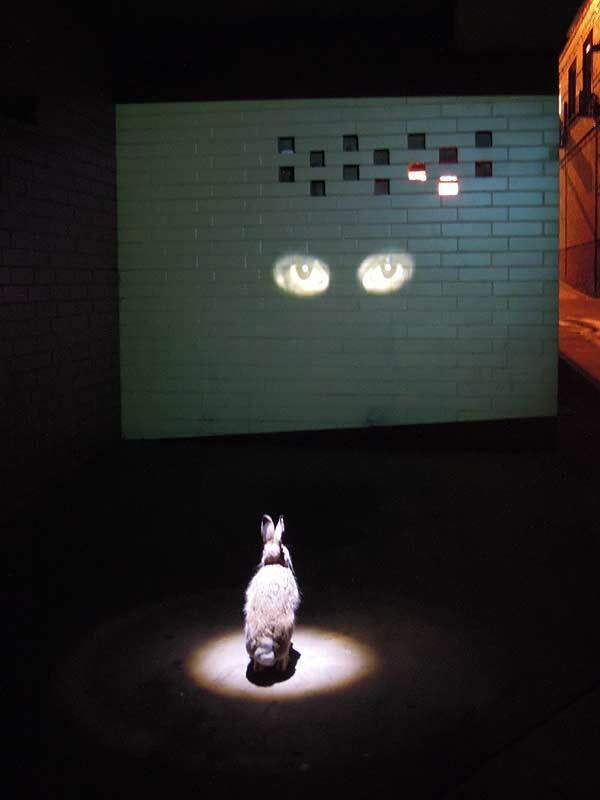 Jade explained she was looking at where nature, humanity and machine meet and is also examining progress, where people get swept along and are unsure of change, sometimes caught like a rabbit in headlights. It was a powerful work to experience, the mix of digital and sculpture worked extremely well in the location chosen. Then we were back into the bright lights of the main streets as we headed toward Nicole Jackson’s Journey, a map of Dandenong executed in gaffa tape on the wall of a building. The various colours, which haven’t come out so well in the photo, mark the different levels of traffic in the streets depicted. I liked the use of an interesting medium, I haven’t seen gaffa art before. 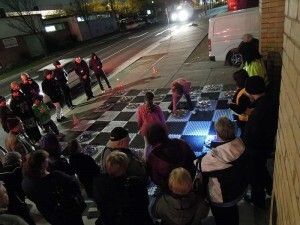 Our last work was Phil Nevin and Verne Krastin’s Quest for a Vacant Space, a giant game of checkers using hub caps as the pieces. I stood on some steps of the next door church to take photos and, as a result, didn’t hear the artist talking about the work. Which just goes to prove that sometimes, capturing an event for the future means you don’t get to actually be in the moment to learn more about what’s happening right in front of you. But that’s the way it goes. Driving down a nearly empty freeway on the way home, I realized that spending the night looking at artworks lit by streetlights and torches had changed the way I looked at the world. 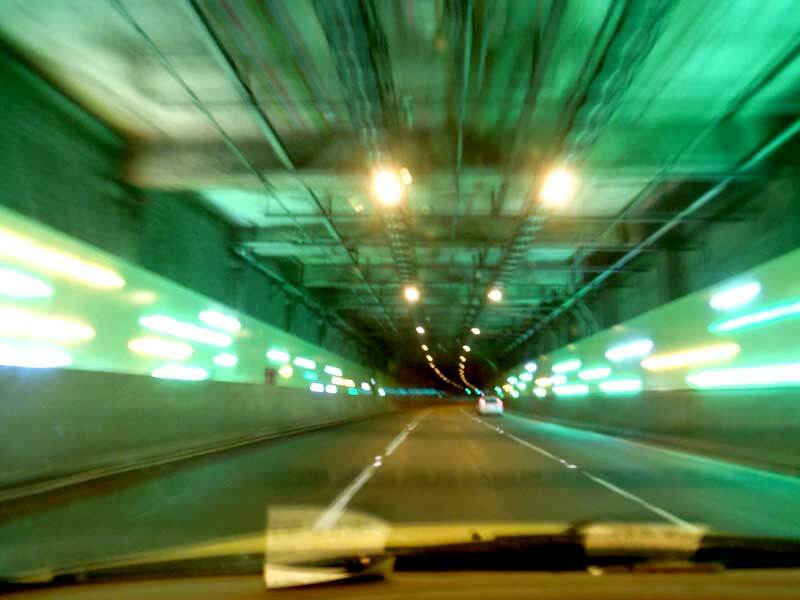 The car lights, the street lights, my head lights in the tunnel (below) all picked out different tiny moments and together they made a symphony of beauty in the world. Nocturnal reminded me to find the beauty in the every day, to look at the world and really see it, rather than just skim over it while I think of other things. It taught me that doof-doof cars are actually a work of art in their own way, and that the music that pours out of them can be a symphony rather than a cacophony. It was an incredibly moving night of art and I wouldn’t hesitate to recommend it to anyone. I went to the event also. 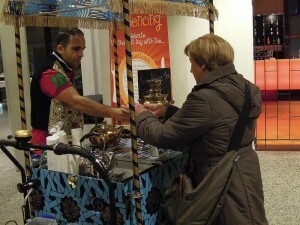 I had a wonderful time, it’s nice that this type of event takes place. I wrote a post on the event too, if you would like to check it out. By the way I love your project ‘For you Stranger’, I think it brings happiness to people, and the cupcakes look really yum. Have a nice day! I think that events like these are an amazing celebration of art in the public space and really does change how people look at the world. 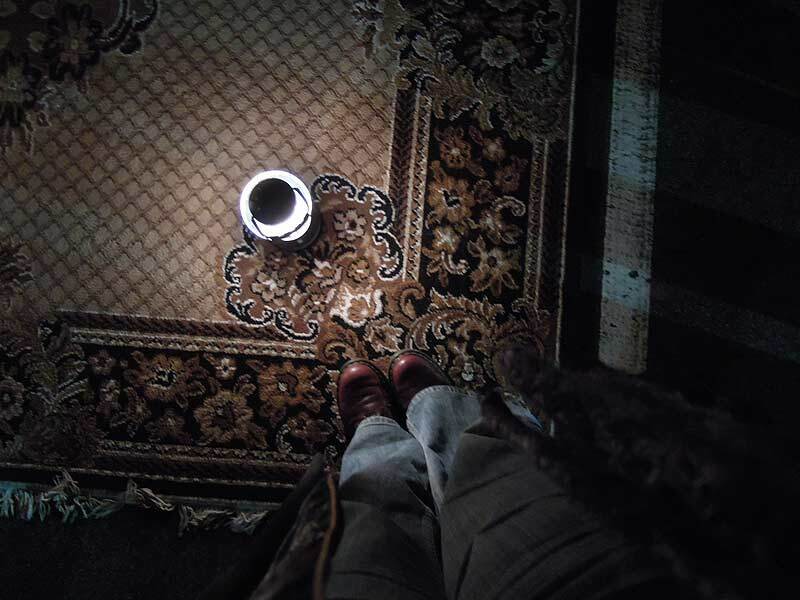 I checked out your blog post, you captured the night perfectly and took some great shots. Thanks for your kind words on For you, stranger. I really like the project and look forward to doing another drop really soon.